AEM Tru-Time Adjustable Cam Gears increase horsepower and torque without having to change the camshaft(s) and are must-have items for engines that are milled, forced induction, high compression and/or utilizing aftermarket competition cams. Tru-Time cam gears enable users to match cam timing with their vehicle's tuning state by advancing or retarding the cam profile(s) in one-degree increments via true laser-etched markings. Precision-cut gear teeth ensure no premature wearing of the cam gear's belt surface and AEM's anodizing on the adjustable cam gear's teeth is lab-test proven as the hardest anodizing process on the market. 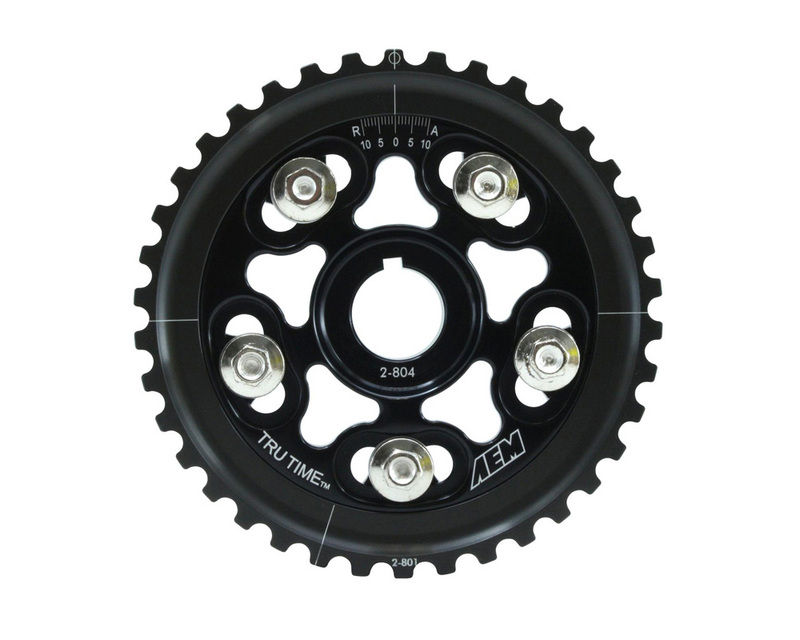 AEM Tru-Time Adjustable Adjustable Cam Gears are available in a multi-spoke, five-bolt designs. When racers and enthusiasts buy AEM performance parts, they are getting the finest engineering, highest quality and best value our industry has to offer. Look no further than our products for proof. AEM created the first stand-alone programmable engine management system that uses a factory wiring harness, and was the first to introduce a gauge with a built-in wideband UEGO controller and gauge readout in one unit! More recent innovations include our Water/Methanol Injection Systems, which provide the ultimate combination of performance, quality and value for gas and diesel race vehicles, a complete line of digital and analog display gauges, and the X-WiFi module, which allows users to view critical exhaust data wirelessly on virtually any WiFi enabled device. In addition, the recent release of AEM’s Series 2 EMS with AEMTuner interface software represents a major evolution in features and ease of use from the original.